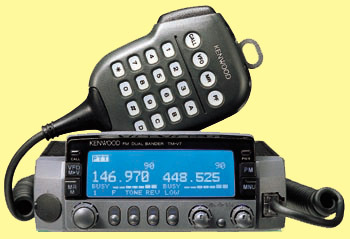 The distinctive Kenwood TM-V7A has an easy to operate control panel and a cool-blue reversible LCD. You can change the display with a dimmer and a contrast adjustment. There is a lot more inside including the five-in-one programmable memory, DTSS and pager functions, 280 memory channels (180 channels if you are using 7 character alphanumeric memory taggings) plus the ability to receive two frequencies on the same band. Other advanced features include: S-meter squelch, time-out timer, dimmer, auto power-off and supplied MC-53DM backlit DTMF mic. There is a 6 pin mini DIN connector to facilitate 1200/9600 bps packet hook-up. Copyright 1998-2017, Universal Radio, Inc.